It’s almost the tax filing deadline. During April, many people take advantage of the opportunity to reduce taxes by funding a Traditional IRA. While that makes sense for some Americans, others may benefit by contributing to a Roth IRA that offers no immediate tax break, but has other tax advantages, such as tax-free growth potential and tax-free income during retirement. Some people may realize the greatest benefit by having both types of IRAs. You won’t get a tax break today, but any earnings in a Roth IRA growth tax-free. Distributions taken from a Roth IRA are tax-free, too, as long as certain requirements are met*. That means the income from your Roth IRA is protected from future tax increases. You can leave the money in your Roth IRA until your heirs inherit it. You can’t do that with a Traditional IRA. At age 70½, you must take required minimum distributions (RMDs) from Traditional IRAs. Generally, RMDs are taxable and, if an RMD is not taken when it should be, a hefty penalty is assessed. You don’t have to be age 59½ to take a penalty-free distribution from a Roth IRA as long as the distributions are used for higher education costs, qualified home purchases, unreimbursed medical expenses, or specific other expenditures. Taxable accounts offer immediate access to funds. Money that is saved or invested in taxable accounts – like brokerage or banks accounts – have already been taxed and can be spent at any time. Tax-free accounts offer a tax break in the future. For example, contributions to a Roth IRA are made with after-tax dollars but any earnings grow tax-free and distributions may be tax-free. Having tax-free income during retirement may help you stay in a lower tax bracket. Open an account at any age. Anyone, of any age, who has earned income, can open a Roth IRA. So, you can fund a Roth IRA for yourself any time. You can also fund one for a child or grandchild who works, and give him or her a head start on saving for retirement. Contribute as long as you work. While contributions to Traditional IRAs must stop at age 70½ (when RMDs begin), that is not the case with Roth IRAs. 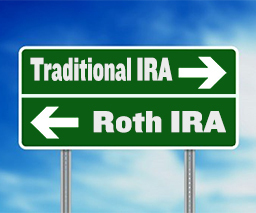 As a result, Roth IRAs provide legacy and estate planning advantages Traditional IRAs do not. To find out if a Roth IRA is right for you, talk with a financial advisor today.